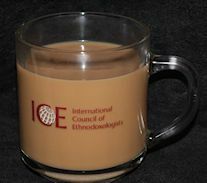 Now you can proclaim your ICE membership wherever you go with your own ICE t-shirt! Only $15.00 each! Now you can proclaim your ICE membership wherever you go! This attractive, machine washable ICE t-shirt is available in large and x-large size (note that sizes tend toward smaller than usual). Only $15.00 each! Visit our International Orders page if you'd like to have your order shipped outside of the United States.